Don't risk your comfort or your budget on do-it-yourself or unqualified handymen. Work done by an unlicensed contractor may void your homeowner's policy. Your Cape Cod Master Plumbers are licensed, bonded and insured. With over 100 hours of continuing education each year, Tim McElroy & his team are expert in the state of our art. The typical Massachusetts plumber spends no more than the six hours required to maintain his license. Water bills too high? Most homes have undetected leaks that waste hundreds even thousands of gallons each year. There are a lot of older homes around the Cape, and a lot of them have plumbing that breaks! 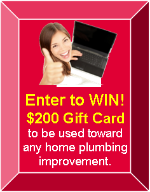 When your plumbing fails, you want it FIXED FAST; you want it FIXED RIGHT THE FIRST TIME! Slow or blocked sink, shower, or tub drain? Don't grab caustic damaging chemicals or a plunger. Call your drain clearing experts. We're equipped with the exact solution including household drains, main sewer lines, rainspouts and run-off pipes. We specialize in high efficiency home radiant heating solutions -- whether its repair, maintenance or replacement. We're here to replace old inefficient fixtures and toilets with the modern water-saving and maximum comfort designs. Whether it's a standard storage tank heater or an energy and water-saving tankless demand heater, we have the solution. We install, service and repair all types and models. Our exclusive water heater inspections -- FREE with every visit -- will add years to your water heater's life!